It is now understood that everyone learns differently and that some styles of teaching don’t always benefit others. 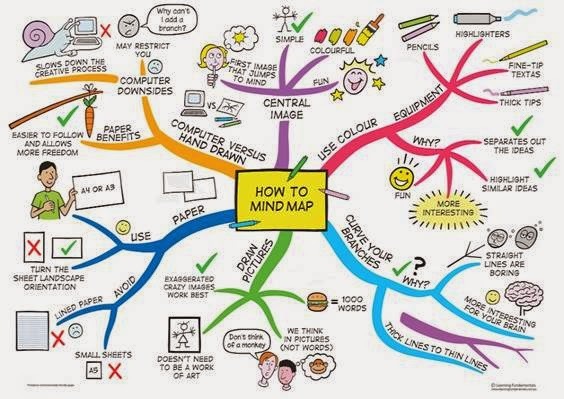 Mind Maps sometimes called Brain Storming are visual diagrams used to represent concepts, ideas or tasks. They are made up of words, colours, lines and pictures linked and arranged around a central key image or word. They are really useful for students who are visual and kinaesthetic learners as well as students who are creative. Mind Maps also help you to see the BIG picture, whilst also seeing how concepts and themes come together to form a whole! 1. A central image is drawn in the middle of the page that represents the main topic; this should contain a picture and can have words. 2. From this image, thick branches are drawn on which the main ideas for the topic are written. Each branch should be a different colour. 4. From each of these branches other connected branches are drawn that contain additional information about the topic/subject. Stick to three colours! Make it bright, link similar concepts together with a colour. Vary the size! Make headings BIG and subheadings smaller. Be creative! Use as many images a possible, instead of words use pictures. This is a map of the students mind, written in a code only they can understand. To make associations between words therefore strengthening their meaning and also create links between these words to improve classification and organisation of material. •Link ideas together, helps you to remember more information about a specific topic. •To facilitate retrieval of information and see the big picture. Eliminates 90% of unnecessary note taking, and so improves the quality of the notes you do take by 10 times. •Generation of new and innovative ideas.